Suitable for a range of purposes including trenching, landscaping, utility and excavation projects, Carnegie Rental’s range of mini excavators for hire will help you get the job done quickly and efficiently. Offering an extensive range, our mini excavators are safe and easy to use, with an assortment of attachments such as post hole diggers and jack hammers. Browse our range today to find the model that best fits your project! Multipurpose 1.6 tonne diesel powered mini excavator, ideal for trenching, landscaping, utility and excavation projects. Using unique hydraulically extendable track system and breakout force to ensure stability at a deep working depth. Common applications including trenching for sewerage, electricity and storm water, ground levelling and safe movement of earthing and building blocks. Safe and easy to use for any level of operator. Featuring a jackhammer attachment. 1. How much does it cost to rent a mini excavator ? 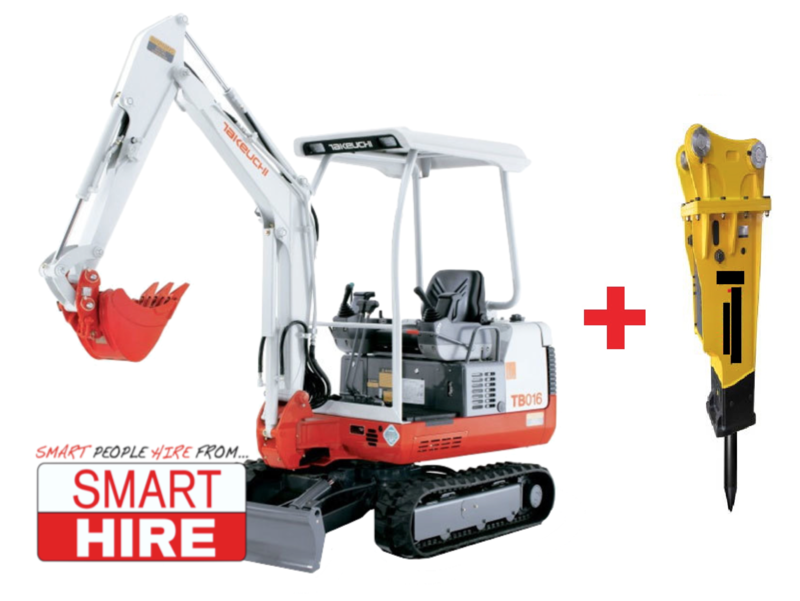 : The cost of rental/hire within Australia of most mini excavators can range between $300- $500 over a 24 hour hire period, depending on the machine quality, size and rental service. 2. How much does it cost to have someone operate a mini excavator ? : Ranging from every small to large excavation projects, most excavator drivers will charge at minimum $600, and jobs can increase past to $10,000 dollars depending on the job size and difficulty. 3. Do I need a license for a mini excavator ? : According to Worksafe (23/10/18), a certificate is no longer required to operate an earth moving or particular crane (EPC) occupational class of machinery; meaning that anyone from the public is welcome to come and use our entire range of excavators, mini loaders, trenchers and bobcats, without needing licensing. 4. What does a mini excavator do ? : An excavator is hydraulic construction/ digging machine that consists of a boom arm mounted bucket, attached to a rotating cabin above driving tracks. It is used primarily for digging wide trenches, holes and general earth moving. Excavators are preferred when a wide range of motion is needed. For machines designed to move large volumes of earth, a mini loader or bobcat is recommended. 5. How to use a mini excavator :(Please refer to the linked video) An excavator uses a simple system of joysticks and handles to both drive and operates its tracks, arms, and attachments. The skills required to operate one can easily be learned within 10 minutes use.